Many factors go into building a circuit board that will last a long time. As technology shrinks and surface mount components become commonplace in the pipe organ industry, it is important to understand that not all components, not all circuit boards, and not all manufacturing processes are created equally. We have been told stories of a fairly famous pipe organ that needs to have a hair dryer used on some of its circuit boards to get it to play correctly. Some of our competitors make cheap circuit boards and then stand ready to overnight you a new one when they fail. Yet others make such complex boards that failure is certain, the only question is time. When manufacturing electronics, if a very small quantity of boards is desired, they can be built by a bench technician by hand. This is the easiest way to retain control over the quality of the product - a DRI (directly responsible individual) is hand building the product with components that are hand-sourced. This becomes inefficient very quickly (and ties up a talented technician or two), which leads to the desire to source a "fab shop" or contracted circuit manufacturer. Often, these "fab shops" will source the materials used in board construction. These shops often have large contracts with component providers overseas. This can result in unknown quality components and can lead to long term reliability issues. 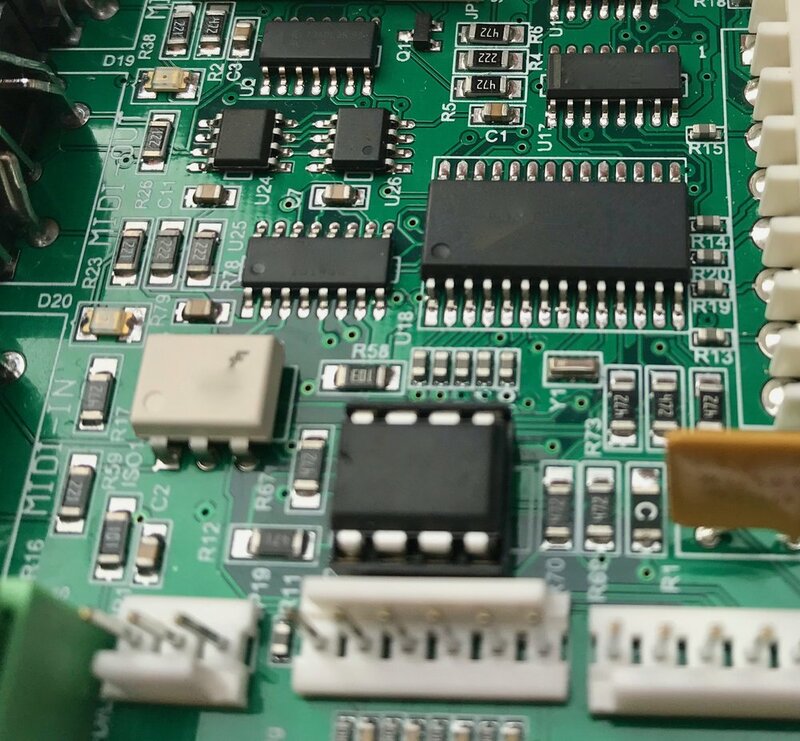 Opus-Two circuit boards are manufactured by one of the finest shops we have ever worked with, and they use components we have sourced and supplied - we ensure that components are coming from manufacturer authorized distributors. This gives us an unusual level of control over the quality of each and every component going into the product. Our manufacturing partner has an aggressive QA policy, follows six-sigma TQM guidelines, uses only IPC trained machine operators, and follows all ESD guidelines. These high quality standards have resulted in a failure rate at initial test of well under 1%, which is nearly unheard of in this industry. So many other factors affect circuit board design and quality. Using long life cycle components, taking the time to plan heat dissipation, board washing QC and technique, aggressive multi-stage multi-point testing, and careful record keeping are just some of the things we do to ensure our products are amongst the highest quality in the industry.